Students “Ooh’ed,” “Aah’ed,” gasped and smiled as they visited with some furry, scaly, or hairless guests on campus Wednesday, Nov 4. 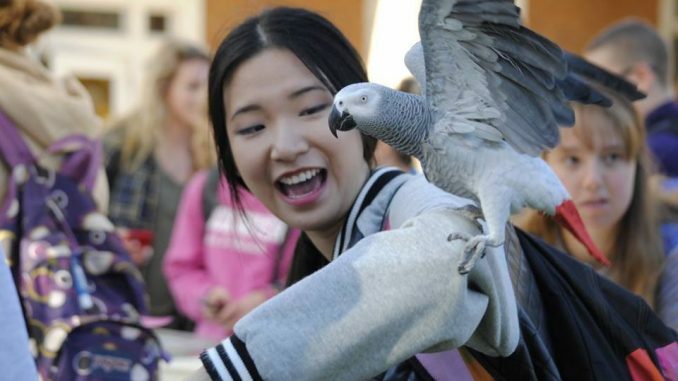 Union Board’s Exotic Animals event allowed students to touch or hold animals like chinchillas, foxes, tarantulas and even gators. The animals were provided by Animals Rentals Inc., a company Zinkel said takes great care of their animals. For example, a scheduled animal was not fit to travel the day of the event so they brought a replacement. The complete list of animals at the event is as follows: African grey parrot, American alligator, albino Burmese python, chinchilla, fennec fox, geoffroy cat, hairless rats, hedgehog, leopard, skunk, tortoise and tarantula. Check out the photo gallery for students’ exciting first moments with the animals and see if you can find your favorite!